Perfectly balanced for hard cornering and wide-open straight-aways, the newly designed SuperJet hull features molded-in sponsons positioned forward on the craft that increase the wetted surface area of the hull. 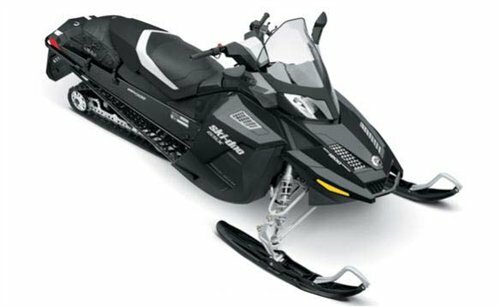 This allows the craft to turn easier while making the SuperJet more stable for novice and intermediate level riders. The SuperJet™ is powered by a high-performance, two-cylinder, 701cc Yamaha marine engine. Two 38mm Mikuni carburetors feed this world-class powerplant, providing excellent throttle response throughout the total RPM range. Yamaha Loop-charged Combustion: Fuel mixture actually loops as it enters the combustion chamber, which helps distribute fuel/air mixture evenly for better combustion, performance and fuel economy. Corrosion Protection System: Sacrificial zinc anodes protect the engine from harmful galvanic corrosion. Stainless steel fasteners (nuts, bolts, hardware) provide a long service life. Cylinders, cases and heads are all treated with a durable oxide coating to form a barrier between corrosion and expensive engine parts. Electronically Controlled, Variable Ignition Timing: For exact ignition advance control at all throttle positions and RPMs.The Jet Pump Propulsion System - The SuperJet 144mm Hyper-Flow jet pump propulsion system : The new three-blade stainless steel progressive pitch impeller is designed to maximize water flow for high performance. The SuperJet pump configuration provides excellent hook-up and smooth acceleration. The Jet Pump Propulsion System - Stainless Steel Impeller Housing Liner: For high durability, the liner maintains accurate clearance tolerances between the impeller and the housing. The Jet Pump Propulsion System - High Flow Intake Duct and Grate: The dynamic shape of these items directs water flow into the pump for better thrust, performance and hook-up. The Jet Pump Propulsion System - Pumps are Manufactured with YDC30: A combination of zinc and copper alloys, developed by Yamaha marine engineers, that offers excellent corrosion protection.The Hull and Deck - Perfectly balanced for hard cornering and wide-open straight-aways, the newly designed SuperJet hull features molded-in sponsons positioned forward on the craft that increase the wetted surface area of the hull. 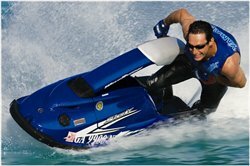 This allows the craft to turn easier while making the SuperJet more stable for novice and intermediate level riders. High-performance, Concave Hull: The lightweight, concave hull design of the SuperJet provides superior grip and agility on the tight turns and allows a true feeling of adhesion to the water's surface. Environmentally-minded Innovations: By employing proven technologies, Yamaha delivers significant reductions in noise levels without compromising performance and reliability. The Hull and Deck - Yamaha Sound Suppression System: This system of integrated noise reduction components targets the three common types of noise: 1.) intake noise, 2.) exhaust noise and 3.) noise from vibration. Additional Features - Oval-shaped Handlepole: This handlepole design is 40 percent lighter and 50 percent stronger than conventional handlepoles and its high pivot position gives the rider more leverage for easier transitions and turning. Additional Features - Corrosion Resistant Coil Spring: Makes the handlepole feel lighter for optimal control and reduces rider fatigue. Additional Features - Thickly Padded Ride Tray: Padding is provided on the deck, gunwales and handlepole for a more comfortable ride. Kick Step: Provides riders with a slip resistant surface and added balance. Automatic Bilge System: Removes water from the engine compartment. Additional Features - Transom Exhaust System: Adds performance while reducing noise levels. Adjustable Steering System: Allows the rider to adjust the steering nozzle angle and turning performance. 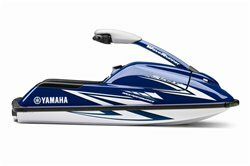 Additional Features - Yamaha's Trademarked Visibility Spout: A waterspout from the rear of the craft that improves the craft’s conspicuity.